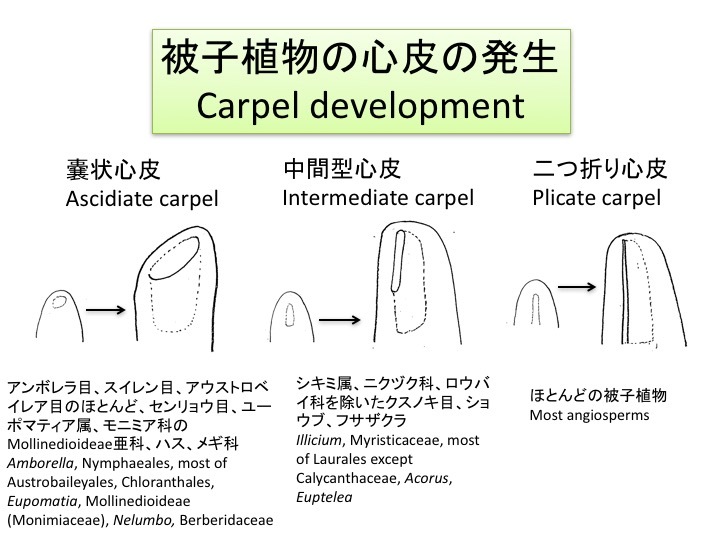 Three types of carpels as follows（Endress 1994)。Plicate carpel: the transition between inner and outer primary surface has the form of a slit from the base to the top of the carpel in its ventral side and the slit is postgenitally closed (e.g. most angiosperms). Ascidiate carpel: The transition between inner and outer primary surface is restricted to the top of the carpel and its wall is congenitally closed throughout (e.g. Amborella, Nymphaeales, most of Austrobaileyales, Chloranthales, Eupomatia, Mollinedioideae [Monimiaceae], Nelumbo, Berberidaceae). Intermediate carpel: Intermediate between plicate and ascidiate carpels (e.g. IIllicium, Myristicaceae, most of Laurales except Calycanthaceae, Acorus, Euptelea). There were long debates on the ancestral type of carpels (Soltis et al. 2005. 76 page). For example, as a strong hypothesis, Bailey and Swamy (1951) proposed that plicate carpels are ancestral and other types including ascidiate ones are derived. Recent molecular phylogeny showed that ascidiate carpels are ancestral (Doyle and Endress 2000). Developmental studies at the cellular level are necessary to understand the evolution of ascidiate, intermediate, and plicate carpels. Also comparison between ascidiate leaves and carpels may give some insight on their evolution. Bailey, I.W. and Swamy, B.G.L. 1951. The conduplicate carpel of dicotyledons and its initial trends of specialization. Amer. J. Bot. 38: 373-179. Doyle, J.A. and Endress, P.K. 2000. Morphological phylogenetic analysis of basal angiosperms: comparison and combination with molecular data. Int. J. Plant Sci. 161: S121-S153. Endress 1994 Diversity and evolutionary biology of tropical flowers. Cambridge Univ. Press. Soltis, D.E., Soltis, P.S., Endress, P.K., and Chase, M.K. Phylogeny and Evolution of Angiosperms. Sinauer.